WE SHIP ALL ACROSS THE USA!!! - ALL PRICES INCLUDE DELIVERY within 48 states. Give us a call at 1-800-364-3551 today and let us price one for you today! Many horse trainers prefer a round pen with solid walls to block the horse's vision on the outside of the pen.You can use this material to do the same thing for your current or portable pen. Available in coated nylon with a choice of colors or 90% screen material. These Arena Wraps are easy to install with zip tabs or rope. They are about 5 foot tall and will fit most stock panels. Just specify the length or diameter of your pen and let us make one for you! 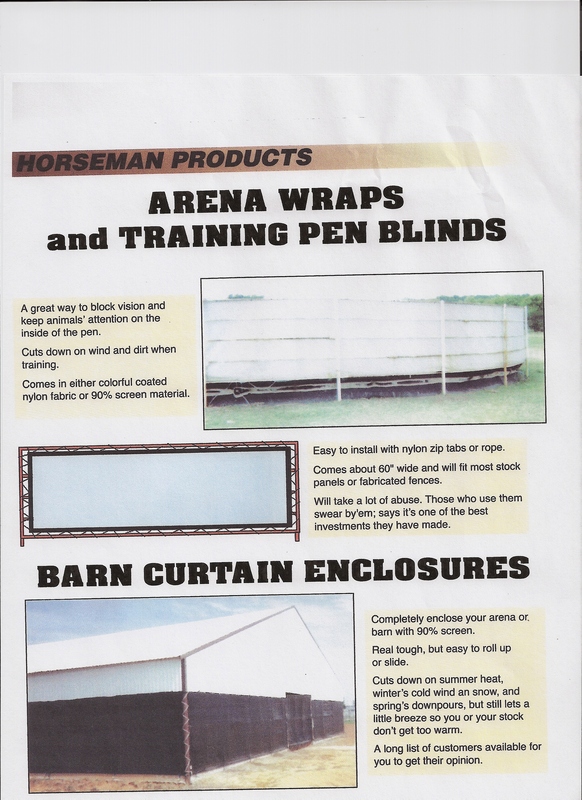 Completely enclose your Arena or Barn with 90% screen. Real tough but easy to roll up or slide.